If you visited Bordeaux chances are you made it to the right bank. There you’ll find several famous appellations vying for attention including Pomerol, the smallest of Bordeaux’s most esteemed. And in this AOP (Appellation d’Origine Protegee) where there are several families who own and run smaller wineries you’ll find a small but large producer, Château de Sales. Perhaps you aren’t familiar with them. They’ve been discreet until now. 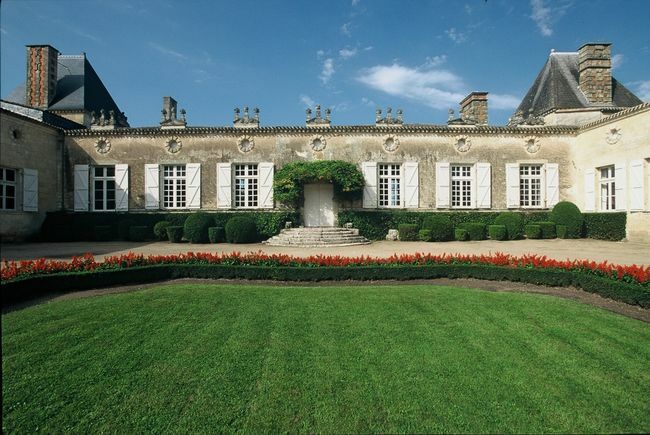 This is a château where the family lived for more than five centuries. At ninety-two years of age the second wife of one of the grandfathers continues to enjoy its charms daily. Over the years most family members chose to live off the property, but annual gatherings bring them together: the remaining grandparents, fourteen cousins, and their forty-five grandchildren. All are descendants of François and Jean de Sauvanelle at Château de Sales. I recently enjoyed a Château tour and tasting accompanied by my friend Evelyne Resnick. We discovered this sleeping giant is about to shake the world! The backside of Château de Sales where the gardens start. 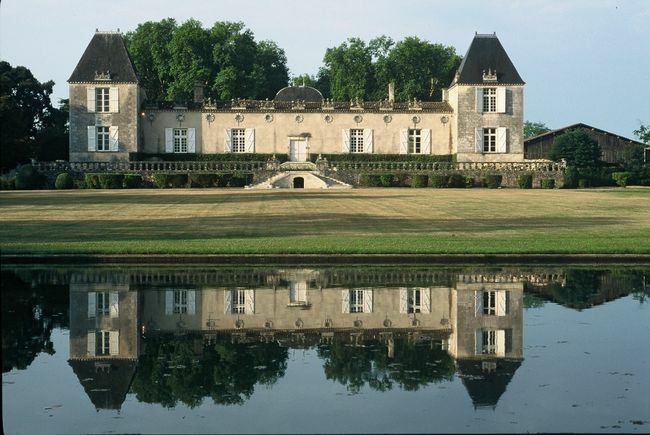 Deemed a historical monument in 1996, the Château has a fascinating background. Dominican monks owned the property prior to 1464, where they farmed the land and planted fruit trees. Unfortunately nothing remains about this and earlier periods because the archives were burnt during the French Revolution. Bertrand de Sauvanelle acquired the property and house in 1464. Between the 16th and 17th centuries his direct descendants, François and Jean de Sauvanelle, built what you see today: a Château in the Chartreuse style. Common to this style is a Pigeonnier perched on top of a large stone gate. It housed pigeons for years before the family turned it into offices. La Barbanne is a stream sitting behind the Château acting as a natural border between the Lalande de Pomerol and Pomerol appellations. 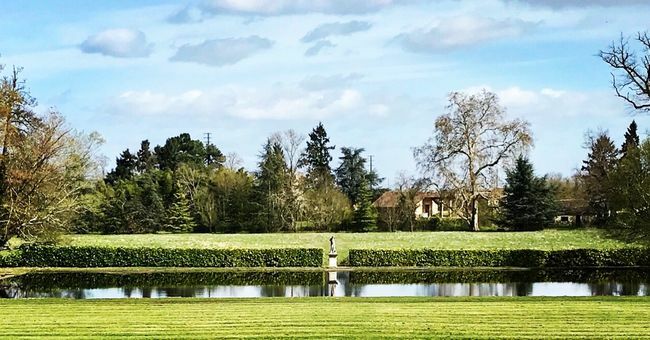 Having a fondness for nature and the out-of-doors the family designed a park and mirror pond between it and the château. These were established between 1770 and 1780. I can envision setting up an umbrella and chair, grabbing a good book and glass of wine, and relaxing next to the mirror pond, can’t you?!? At the start of the French revolution the men of the family, including two of their boys, departed for the safety of Spain to preserve the legacy passed to males. The ladies ended up in jail. When Robespierre died after the revolution, noble families were freed. Once home the ladies found their furniture gone and two-thirds of the property lost. The last son also returned. History recalls him saying, “I’m the owner!” at which point the estate was returned to him. This man, Mr. Deshaygue, was a direct descendant of the Sauvanelle’s. He never married and had no heirs. In 1818 he passed the property and Château onto his grand nephew, Alexandre Delaage. During the Second World War German officers of Rommel used the Château. Luckily they took good care of it! We were lucky to catch a glimpse of the main house. 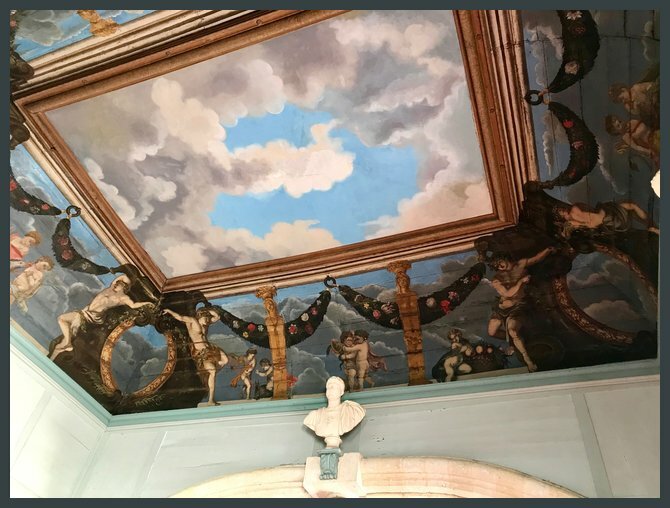 The ceiling holds a mysterious painting covered as you see it here because of its controversial nature. The mystery remains intact today. Marriages and children over the years resulted in Henri and Marguerite de Lambert overseeing the Château. Vineyards total 47.6 hectares (118 acres) planted on gravely, sandy, iron oxide soils: 73% Merlot, 15% Cabernet Sauvignon, and 12% Cabernet Franc. The entire estate is ninety hectares. The latest family member to retire was Bruno de Lambert (the son of Marguerite Delaage and Henri de Lambert). The fourteen cousins who now co-own Château de Sales appointed Marine Treppoz as corporation president. She and her cousins represent the 25th generation heading up the property. They recruited Vincent Montigaud as CEO, a twenty-three year veteran of Baron Philippe de Rothschild. 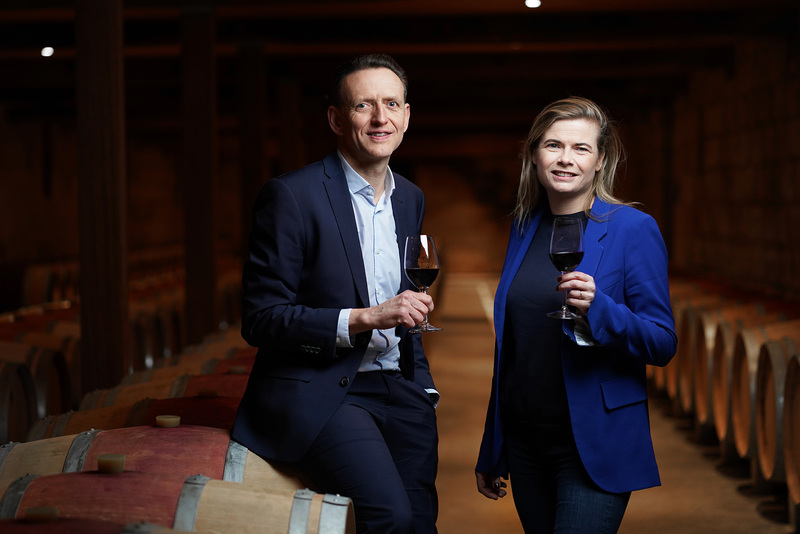 During the visit I spent time with Montigaud tasting their wines while discussing changes and technology this new management team is bringing to Château de Sales. Montigaud works beside his technical manager, Frédéric Laborde, and vineyard consultant Gilles Rey. 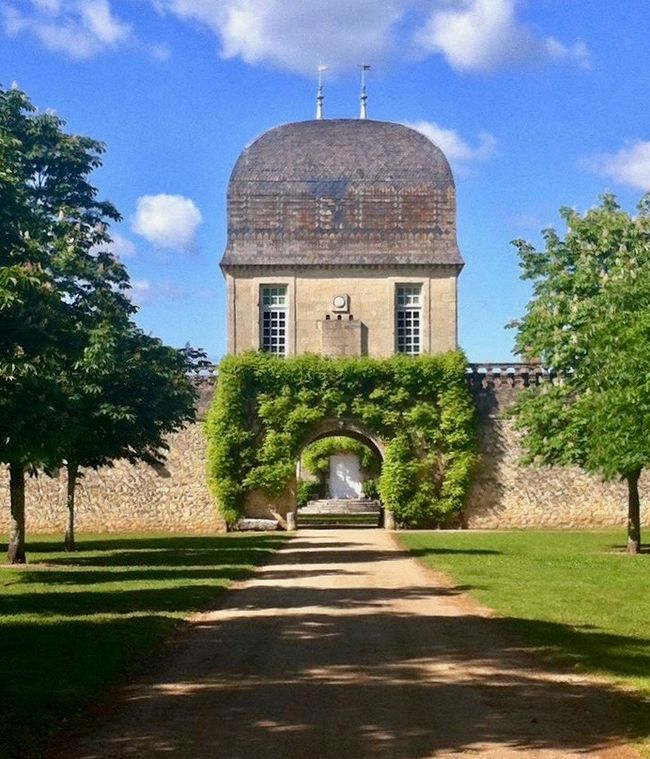 Rey works with several châteaux in and outside of the Bordeaux area, such as Château Mouton Rothschild in Pauillac. There are varying proportions of clay, limestone, sand, and gravel on the right bank offering cool, well-drained, yet poor soils where Merlot thrives. Château de Sale sits mainly on the later two, different from the plateau of Pomerol where there’s more clay. Gravel has the advantage of retaining and reflecting heat and thus aiding in grape ripening. A complete soil analysis is underway to determine nutrient levels. Understanding the soil will assist the team with vineyard related decisions moving forward. Recent changes include the altering of pruning methods after the 2017 harvest moving from Guyot single to Guyot mixed. And other changes are progressing with an objective to obtain berries at optimum maturity. Consulting winemaker Jean-Claude Berrouet assists the team. He brings years of experience including forty years at Petrus in Bordeaux and Dominus Estate in California. Changes include use of thermo-regulated concrete tanks for alcoholic fermentation, a very traditional method. The plan is to use smaller capacity stainless steel vats for increased precision with regard to temperature, maceration length, etc. However over time they may phase them out. Use of large wood casks is also under experimentation for malolactic fermentation. Grapes from each parcel are vinified separately. 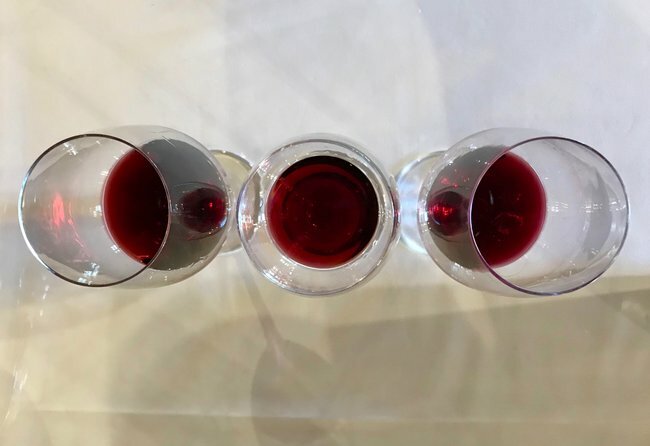 After the second fermentation (malolactic) is complete, they taste all lots and select the best, blending them for their premium wine, Château de Sales. The wine goes into four types of Bordeaux barrels for aging: new, one, two, and three year old. Each barrel is tasted during a twelve month period to ascertain how it’s evolving. During this time the decision to continue or stop oak aging is made. Once stopped, the wine goes back into concrete tanks for fining before bottling. Time frame from fermentation to bottling is about eighteen months, depending on vintage characteristics. For the 2017 vintage, new oak use was increase to 15% (previously only 5%). They don’t want oakier notes in the wine but increased complexity and overall quality while keeping the style round, fruity, and elegant. Grapes not selected for the grand vin go into their second label, Château Chantalouette. Interestingly a law passed in 2000 prohibited wineries from using a completely separate name for second wines. Apparently a different name caused confusion among consumers who could not identify such a wine with the primary Château. But if the second brand was copyrighted before 1983, continued use was fine. It just so happens Chantalouette lives on- it was copyrighted in 1973 by one of the forward-thinking great grandfathers of the family. 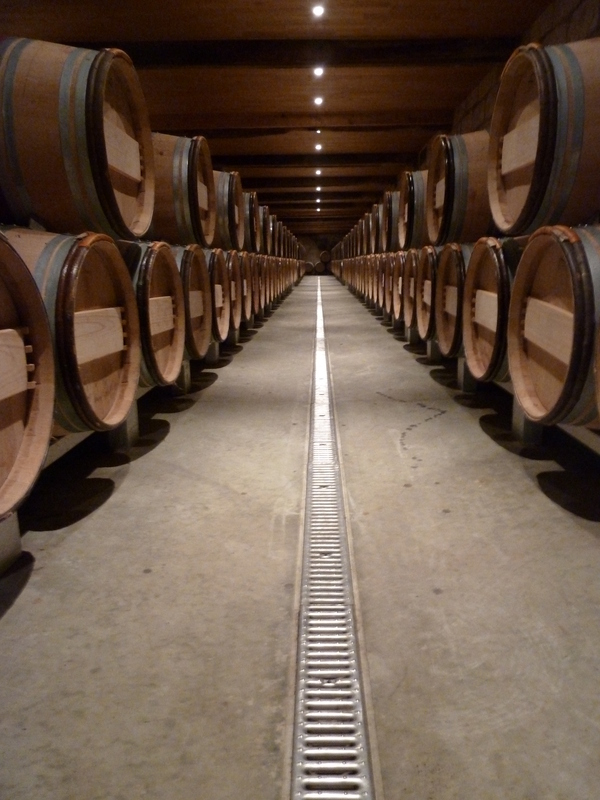 Aging of Château Chantalouette is different including both tanks and barrels. 30% of the 2017 vintage went into used barrels with the remainder in stainless tanks for optimal fruit expression and to produce a style of wine different from the grand vin. Chantalouette is for immediate delight. 2017 was a very difficult year in Bordeaux with a warm start and finish, extreme highs and lows, and devastating frost and hail. 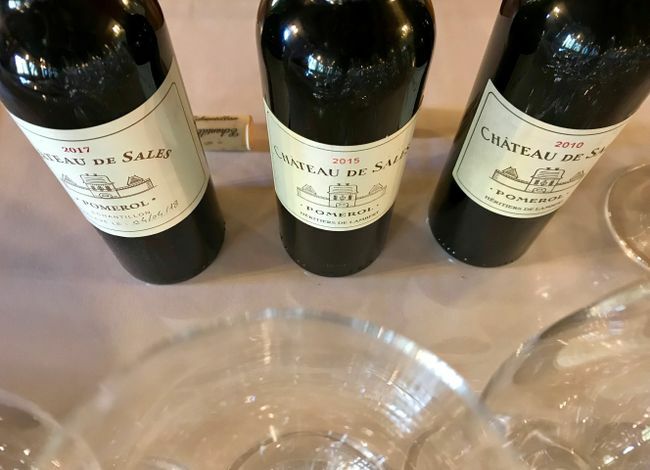 Château de Sales escaped some of the weather and produced an approachable, delicious wine. Cherry, blueberry and blackberry with soft spice and bay laurel aromas, the palate is fresh, acidity relatively low, and tannins silky. A round mouth feel with a tactile sense of aliveness and north of medium body. So elegant at this young age – wow! This is a 78.5% Merlot, 12.5% Cabernet Sauvignon, and 9% Cabernet Franc blend. This wine was lighter in color than the others yet substantial. Red cherry and less ripe blackberry aromas, the wine displays superior balance and faint cinnamon oak hints. The tannins are drying yet polished. While drinkable now, this wine has an acid-tannin structure that will carry it into the future. It could seduce you into drinking now yet my gut tells me to wait several years when the wine will share its true glory. This is blend is 82% Merlot, 9% Cabernet Franc, and 9% Cabernet Sauvignon. Showing beautifully, intense cherry, blackberry and prune aromas are intoxicatingly delicious. The overall balance of fruit, acidity and tannins is remarkable. Tannins are present yet they are chewy-rich and plush. The highlight is spicy pine and a savory touch; it adds thought-provoking complexity to this elegant yet serious wine. Primarily Merlot (82.5%) with 12.5% Cabernet Franc, and 5% Cabernet Sauvignon. While Château de Sales is lovely young, like many Bordeaux wines it improves with age. For Christmas dinner in 2015 the family tasted wines in vintages of five: ’55, ’75, ’85, ’95, and 2005. Apparently the 1955 drank fabulously! These are fabulous examples showing wines dominated by Merlot can provide pleasure in youth yet age for years. 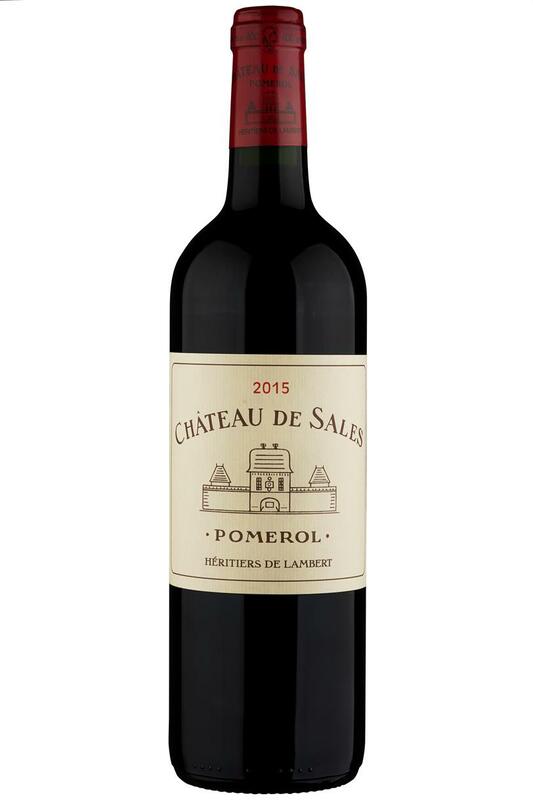 Château de Sales is definitely a producer to watch! A special thank you to Oenotourisme Manager Marjorie Voriot, for her assistance with historical facts. 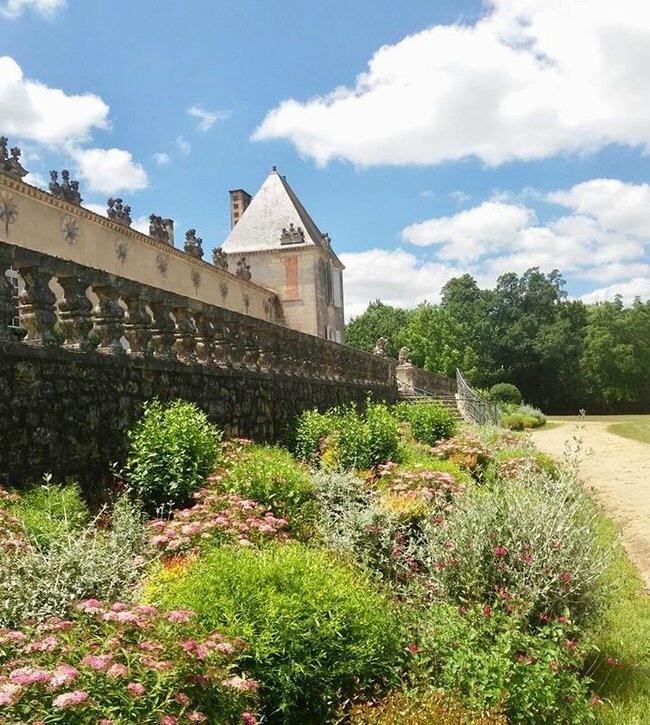 The back side of Château de Sales is lush with plant life and trees. Wow. Now that’s a story! One I will share with friends at the next cocktail party to “show off ” my wine knowledge. Thanks for giving me that knowledge, I didn’t realize Pomerol was the smallest, and the history of the Château. Now need to slather my palate with some Château de Sales grape juice…. Perhaps your next cocktail party will turn into a wine tasting of Château de Sales?! Cheers and thank you John! Happy summer to you! Enjoyed your article and will have to search for this wine. You can envision sitting by their mirror pond, but I can envision sipping on their nice Bordeaux red wine in front of a crackling fire on a cold evening. Wow, what an interesting history. As I learn more about the wines of Bordeaux, I’m learning there’s a lot more behind the wines. Both the main and second wine from this chateau are now on my list. I hope I can find them in the US! Hi Martha, Yes you can get them in the US. Total Wine carries them in various states. Good luck! Amazing article and they are nearby your place. I’ll bet you can pick up at least one, if not two of these wines at Kermit Lynch in Berkeley. Cheers Kay and thanks for stopping by. Great story! I’d love to visit, hope to make it to Bordeaux someday. In the meantime, can I get their wines in the US? Great article Lynn and thanks for the incredible insight. Definitely want to return to Bordeaux just to learn more about Chateau de Sales! A definite château to put on your visit list, thanks Allison. Please let us know when you’ll be back! Wow! sounds like quite a chateau to visit! I don’t think I’ve heard of this one. Interesting about the rules related to a 2nd label, hadn’t heard that before. The château has an interesting history and being able to go inside the main house made it all the more real. Rules in Bordeaux, got to love them. But then again there are upwards of 8,000 wineries so I can see why. Thanks for stopping by David!